I started with a 4.5" square, clear card. In order to photograph the card it was set on top of a neutral cardstock. Below is another photo sitting on my workspace so you can see the difference with the white desk and craft mat behind it. The first layer down is a 4" paper doily that I inked the edges with Tim Holtz Picked Raspberry Distress Ink, then weaved pink and white twine through the center holes and finished with a double bow. Next, I used the Denami Design Upright Happy Birthday stamp to stamp the sentiment in black on a strip of pink polk a dot paper measuring approximately 5.75" x 1.25". The edges were inked in brown and the tail cut in a "v". 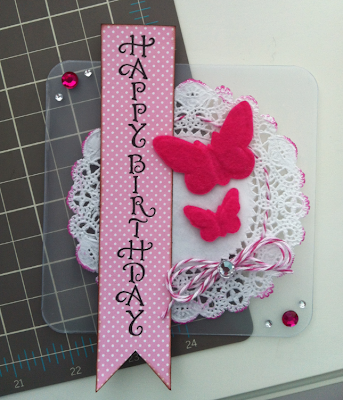 Two pink felt butterflies were then popped up on foam dots for a little dimension. Last but not least, a little bling. A clear gem was added to the bow and pink and clear stones of different sizes were added to the corners. This clear card really turned out cute. In person it really has a bit of a fantasy feel too it. DeNami Design is giving away THREE gift certificates to their website...however, you won't know the winning amount until they announce the winners on Tuesday, March 12th! They will be giving away one gift certificate to a random participant and then they will also be giving away TWO gift certificates to TWO people who comment along the hop! Since it's their birthday month, they'll be giving BIGGER gift certificate amounts, so you'll want to be sure to comment on each stop. You have until March 11, 2013, 11:59 pm PST, to leave comments on all the blogs to be eligible for a prize. Below is the link for the next blog on the hop but be sure and head to the DeNami Design Blog by clicking HERE if you want to start from the beginning of the hop. SOOOO Pretty! I love the clear base, inked edges, the felt butterflies and that awesome banner! Lovely card! The clear base is the perfect for your design! Awesome job! Kerri, I love the inking of your doily and the threading of your twine! Your birthday pennant is fabulous and I love your bling!!! Oh how pretty. The inked edges on the doily and the gems are the perfect touches. I love the happy birthday pennant and the layout of this card! It is perfect! The clear background is very clever! Love the birthday pennant, it looks fab! Great background too. I'm in love with the vertical greeting, so pretty! Very cool!! I would have never thought of this one, either. I am also in love with the vertical greeting! I really love the clear background. What a neat effect! Wow, that clear background is very cool!! I've never seen that done before! So pretty! 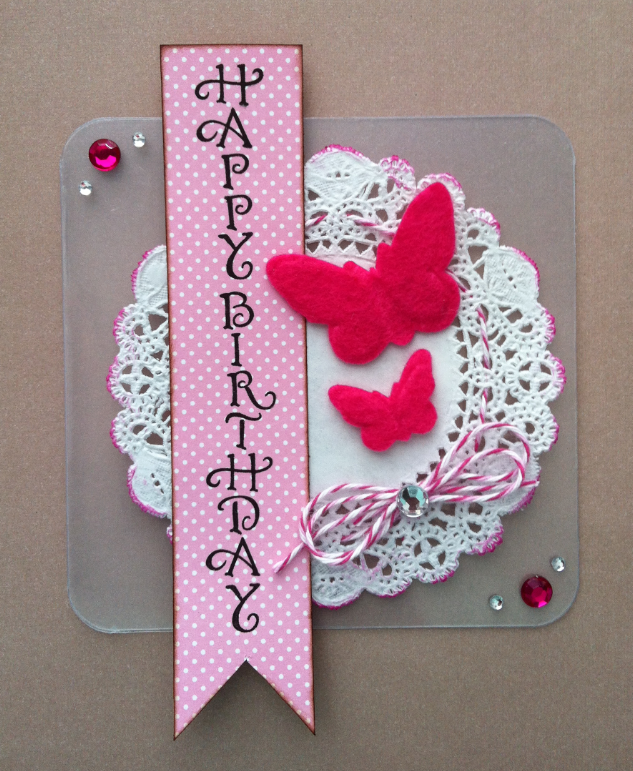 Love the doily and felt butterflies to this fabulous birthday card! Pretty! Love the clear card and the Happy Birthday stamp you used! Very pretty--love the butterflies and doily. Kerri this is a delightful card! The clear cardstock is fun and the pretty happy birthday on the polka dot paper is just darling! Your clear card is FABULOUS, Kerri!!! Love all of the details you incorporated into your design!! Ooooooh, soooo pretty! Excellent job! Very clever idea. Love the pink butterflies. This is really fun! I love this idea of it being clear! I have not been brave enough to try a clear card - yours is magnificent! Love the felt and doily! I'm amazed at how incredible the verticle birthday greeting is stamped on the dotted paper, I've been hesitant to venture out in this direction...but I just might now! What a fun card. Nice textures in this card.